A map that purports to show Chinese mariners discovered the New World before Christopher Columbus could be genuine, university scientists in New Zealand said yesterday. 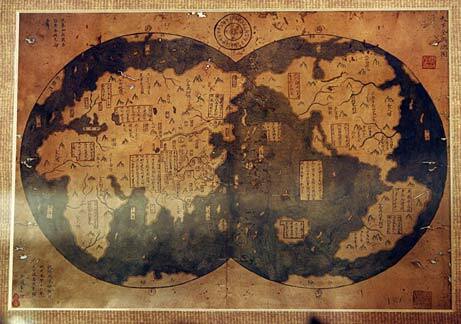 The map, said to be a copy of a 1418 Ming Dynasty (1368-1644) original that has not been located, may trigger a re-evaluation of Chinese and Western maritime exploration. Unveiled in Beijing on January 16, it attracted international attention when owner Liu Gang, a Chinese lawyer and map collector, said the 1763 copy could be proof of a theory that Chinese sailors traversed the globe long before their European counterparts. Radio carbon dating tests showed that paper used for the copy could date back to 1763, according to Waikato University scientists. "There's slightly over 80 percent probability that it is (dated) between 1640 and 1810," Dr Fiona Petchey said. If the map is a genuine copy of a 1418 map, it would mean China's mariner Zheng He discovered America more than 70 years before Christopher Columbus. Western histories record that Columbus found the New World in 1492; Portugal's Bartholomeu Diaz discovered the Cape of Good Hope in 1488; and Portuguese navigator Ferdinand Magellan set off to circumnavigate the world in 1519. The map tested by the scientists clearly depicts the Americas, New Zealand, Australia, Africa and Europe.